Join us on for April’s Kaleo Express – a community conversation with Me’Lea Connelly! Wednesday, April 24th. Bagels, coffee, non-dairy treats, gluten-free delights, and good company starting at 8:30 a.m. Workshop from 9:00 a.m. – 10:45 a.m.
Five years after the Alicia Garca, Patrisse Cullors, and Opal Tometi first tweeted the words “Black Lives Matter,” what does it mean to dream and build and create a world where Black liberation becomes fully realized? What must each of us do if we are to live into the abundant possibility of Black sovereignty and Black power? How would all of our lives be more loving, more interconnected, and more free if we were able to create the material conditions of Black economic self-determination? These are the questions that motivate our April KaleoExpress workshop leader, Me’Lea Connelly. Me’Lea is the founder of Blexit, a grassroots economic resistance organization as well as the Director of the Association for Black Economic Power (ABEP), and the lead director for Village Financial Cooperative – a Black-led Community Development Credit Union on the Northside of Minneapolis, and one of the first of its kind in the country. 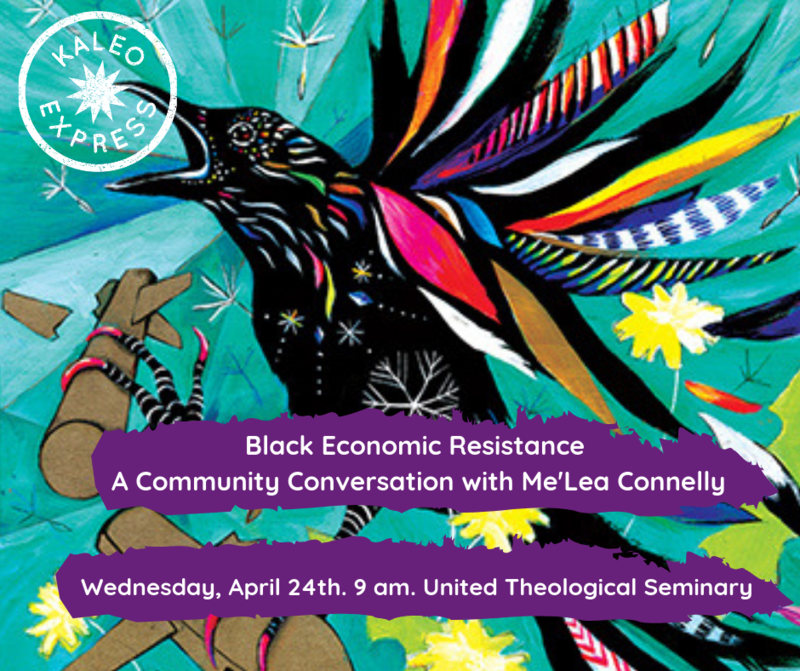 Join us for an interactive community conversation about Black Economic Resistance locally and regionally. You will have the opportunity to learn, ask questions, engage in thoughtful reflection and dialogue, and imagine ways that you can become part of this powerful and necessary movement for all of our communities. We would love to see you on the 24th. REGISTER HERE! Feel free to come late and leave early – we know that folks have lives that do not always run in straight lines. Children welcome! If you have access needs, please contact Kaleo Associate Director at Liz@kaleo.center so that we can accommodate you. We will be live-streaming the event for people who aren’t able to be there in person. PARKING NOTES: United’s new campus is located at 767 Eustis St. in St. Paul. Please park in the south lot at the corner of Wabash and Eustis Streets. You will see a large metal structure in the parking lot, and large “CASE” sign over the main entrance doors. Once you come in the building, walk past the decorative tractor and indoor lawn games, enter the door marked “United Theological Seminary,” and follow signs to the chapel. Me’Lea is the founder of Blexit, a grassroots economic resistance organization as well and the Director of the Association for Black Economic Power (ABEP) whose mission is to “transform local communities by equipping Black people with powerful economic tools and resources.” Currently, Me’Lea serves as the lead director for Village Financial Cooperative – a Black-led Community Development Credit Union on the Northside of Minneapolis and one of the first of its kind in the country. She is a graduate student at St. Mary’s University earning an MBA in Cooperative and Credit Union Management and a 2018 Bush Fellow. 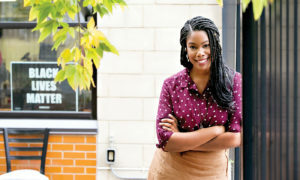 Named one of the 2019 40 under 40 by Minneapolis/St.Paul business journal. Me’Lea is a mother of three, a proud Minneapolis resident, a singer-songwriter and an activist in the movement for Black Lives. Our work is possible because of the generosity and commitment of our donors. Thank you for making sure that we can continue to act boldly in the world towards justice. Become a Kaleo donor here!